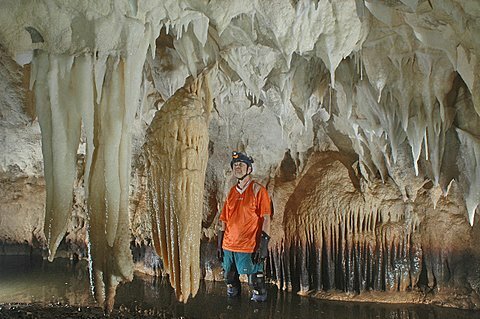 In April 2007 Rutahsa Adventures organized and led a special trip for cavers to Guatemala. 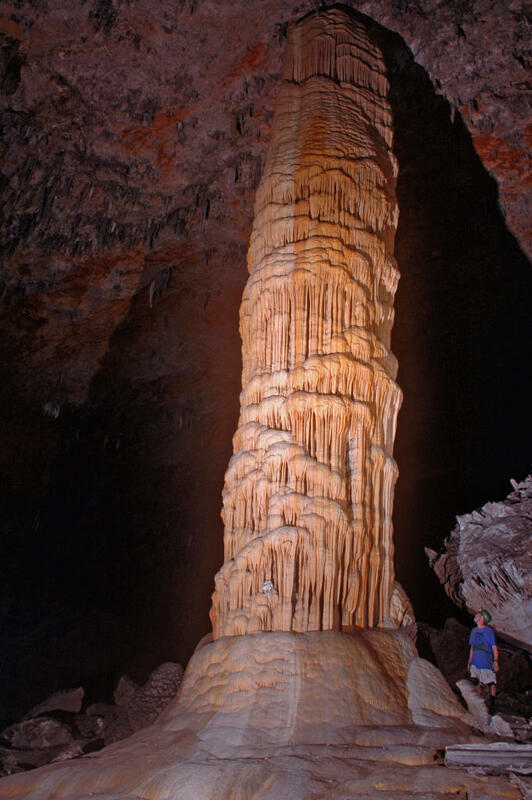 Twelve cavers from Ohio, Kentucky, California and Tennessee participated in the trip, including several outstanding cave photographers. The following images were taken by and provided to Rutahsa by Dave Bunnell, to whom we give hearty thanks! 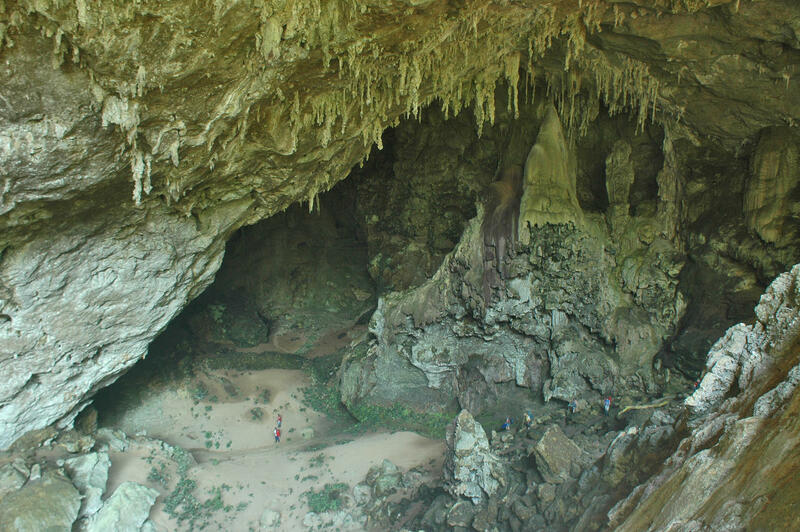 Five caves were visited: Grutas Rey Marcos, Cueva Río Oqueba, Sistema Candelaria, the Xibalba portion of Chiquibul Cave, and Cueva K'an Ba. 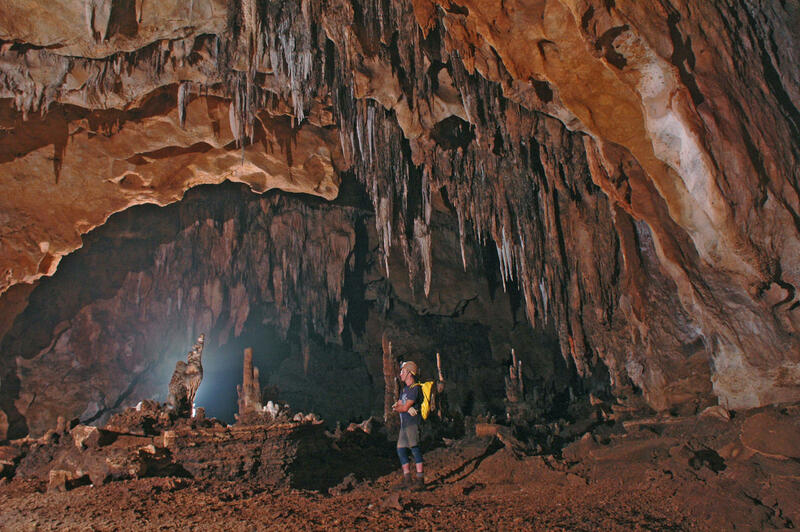 If going all the way to Guatemala sounds like a lot of effort to visit just five caves... Well, you can judge that better when you see the what the caves were like! And in addition to the caves themselves, we had the amazing and beautiful Semuc Champey travertine bridge and pools, plus the major Classic Maya archeological site of Tikal Ruins, charming colonial Antigua, and fiery Volcán Pacaya. 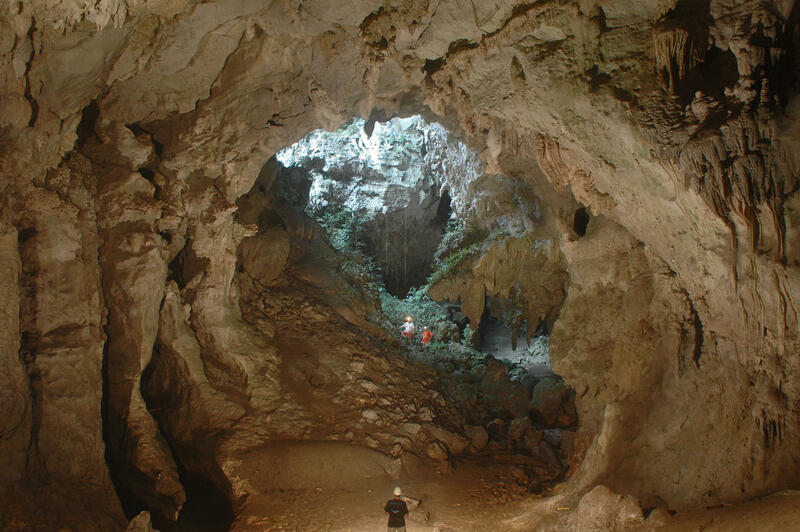 Sistema Candelaria, reportedly 22 km in length, is the longest known cave system in Guatemala. 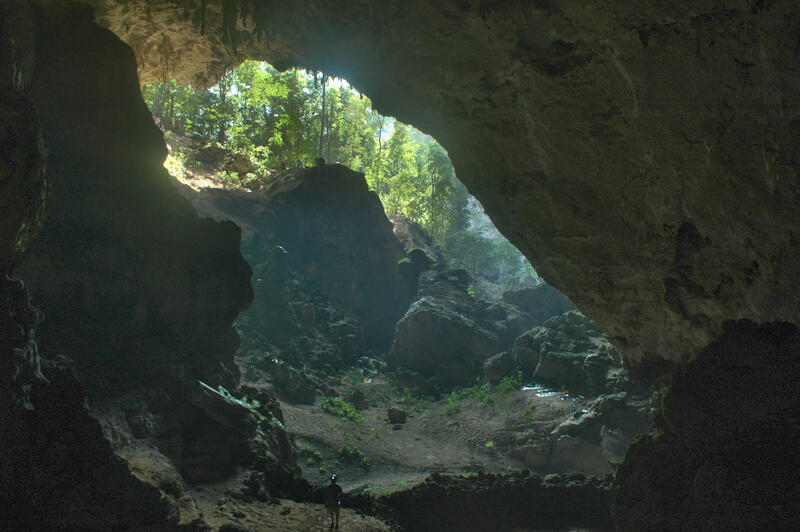 It is a large bore stream cave with numerous collapse entrances or karst windows, each a picturesque mini-paradise of luxuriant tropical vegetation. The main stream passage is commonly 10 to 20 meters wide, and typically high (often 20 to 30+ meters). 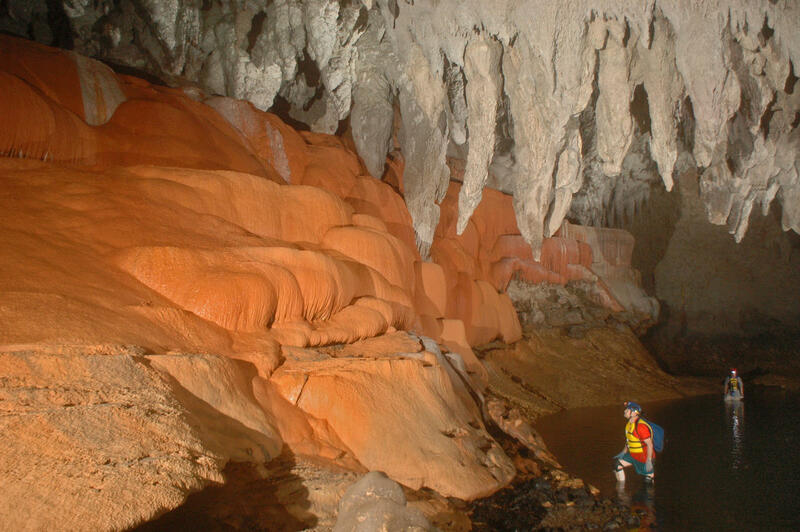 Although there are dry, abandoned fossil sections, much of the cave is active stream passage, and flotation is in order for visiting the cave. 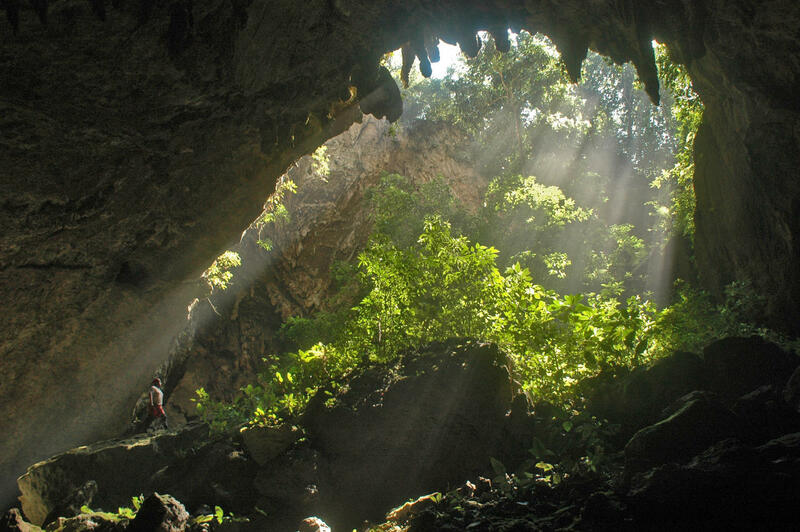 Much of the cave system has been declared a national park and is administered by two local Q'eqchi' Maya villages who supply the guides. Other sections of the cave are under private control. One of Candelaria's many entrances. Stream passage with a beautiful, clean scalloped limestone floor. A section of dry, fossil trunk passage. A spectacular study in contrasting colors. One more of Candelaria's scenic entrances. 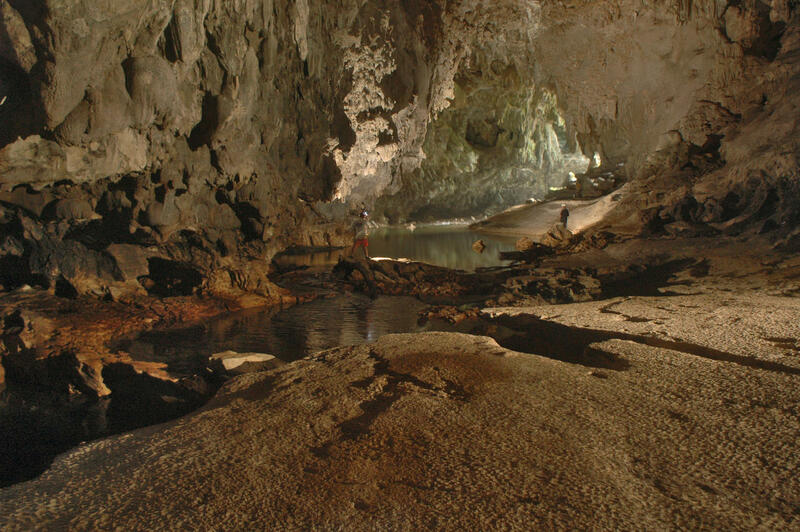 Though all the caves visited were outstanding-- Río Oqueba a sporting stream cave, and K'an Ba especially rewarding for its formations, the true highlight of the trip was a visit to the Xibalba section of Chiquibul. 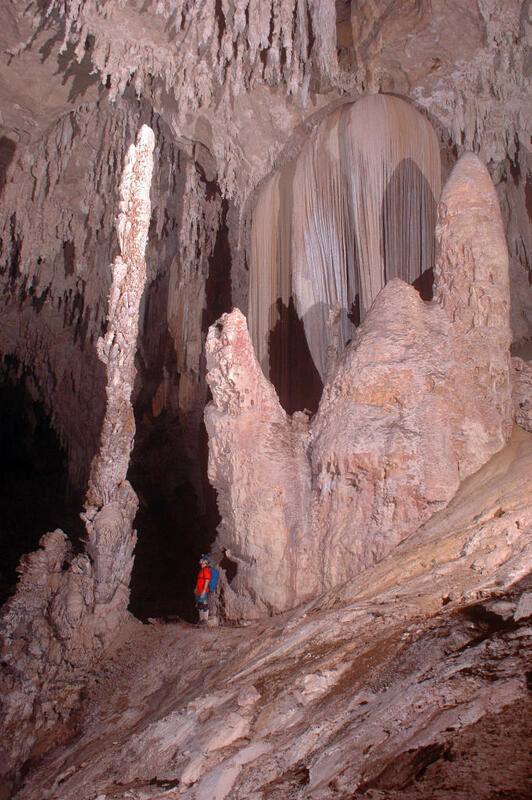 The Chiquibul System is the longest and biggest cave system in all Central America, reported to total 97 kilometers in length. Three of the four major segments of the cave underlie Belice. But the downstream segment, known as Xibalba (the name of the Mayan underworld, pronounced "she-bal-BAH") is within Guatemala. Not wishing to cause a border incident, we restricted our Chiquibul visit to the Guatemalan section. The downstream entrance of Xibalba is where the Río Chiquibul resurges, after having gone underground in Belice and passing through a stygian route of various tens of kilometers length. The Xibalba entrance is monstrous, as two passages converge here to form an entrance 180 meters across. The smaller, on the left as one faces the entrance, is dubbed the "Mayan Wall passage" and indeed contains an impressive Maya-built stone wall and numerous platforms behind the wall. However, the larger passage also contains a major Mayan wall. This right-hand entrance leads upstream to a high skylight entrance, and then through a section of lakes to the Zactun Entrance, which is just inside the border from Belice. Here's a selection of Dave's images, taken in the Xibalba entrance, the Mayan Wall passage, and the main Xibalba passage downstream from the skylight entrance. 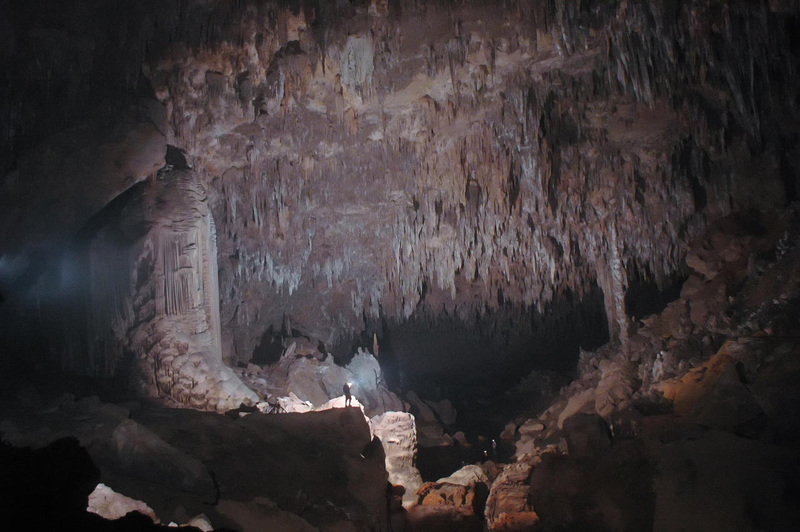 Panoramic shot looking out of the Xibalba entrance; note the size of the caver (circled)! The full entrance is approximately 180 meters across. Looking into the entrance to the right hand passage; note the Mayan wall and seven cavers. The entrance area is a good camp site. A well-decorated, but relatively small (by Chiquibul standards) portion of the Mayan Wall passage. As noted earlier, the main Xibalba passage is HUGE! Besides the guy with the flash unit, note the two cavers further upstream in the water for scale! 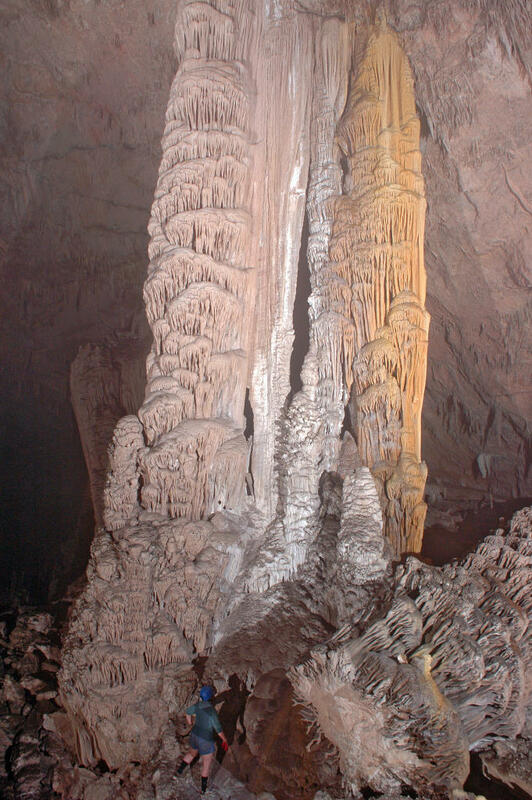 Along the sides of the main passage, high above the active stream level, there are many large formations. Large formations include broken giants tumbled down in eons past, plus great columns still striving for the ceiling. Some of the formations are beautifully colored. 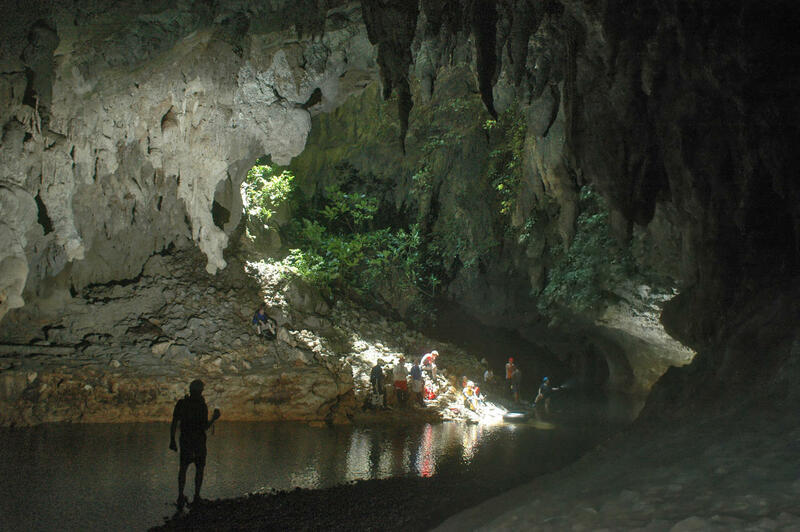 As with most any undertaking of this nature, there were some glitches-- a sixth cave originally on the itinerary was missed due to delays on the road. But when all's said and done, we had a great trip, saw some world-class caves, marveled at the other-worldly scenery of tropical cone karst, enjoyed interacting with friendly Maya people, and took in the major tourism sites of Tikal Ruins, Antigua, and Pacaya Volcano as well. All photos on this website courtesy of Dave Bunnell, @copyrighted.